Big Foot Video Slot Review - Casino Answers! Big Foot is a 5-reel, 25-line video shot developed by the Vegas Technology online casino software provider. The Big Foot video slot features wild substitute symbols, scatter wins and a free games bonus feature. You can play it at English Harbour Casino and Online Vegas Casino. The Big Foot video slot’s top jackpot is 5000 coins, which you will win if you can line up five cryptozoologists on an active payline. The forest symbol is also a significant win, worth up to 2000 coins. Big Foot’s wild symbol is the Big Foot symbol. This symbol will appear only on reels 2, 3 and 4 and will substitute for all other symbols except the scattered footprint symbol. If you hit three scattered footprint symbols anywhere on the reels in Big Foot, you will trigger Big Foot’s free spins feature! In the feature, you must choose which pair of eyes is the sasquatch. If you get it right on the first try, you will win 20 free spins. On the second try, you will win 15 free spins. And if you don’t find him until the third try, you will win 10 free spins. You will also win a multiplier of 4X, 8X or 10X. The free spins feature can be re-triggered. The feature may be almost as elusive as Bigfoot himself, but consider it worth it if you do manage to pull it off. The Big Foot video slot has an autoplay feature with several different settings. The spin settings give you the ability to set the number of autoplay spins (5, 10, 25, 50, 100, 250 or 500) and number of seconds between spins (0.25, 0.50, 1, 1.5 and 2). The stop settings are to not stop until all of your autoplay spins are completed, to stop if a jackpot is won, to stop if a win exceeds or equals your selected figure ($50, $100, $150, $200 or $250), to stop on any win you receive and to stop if credits increase or decrease by your selected figure ($50, $100, $150, $200 or $250). You may cancel the autoplay feature at any time. Big Foot is a good 25-line video slot from Vegas Technology. Its graphics, sound effects and animations are all good. We would have liked to see more creative symbols rather than resorting to some of the generic ones used, but that is only a minor gripe. 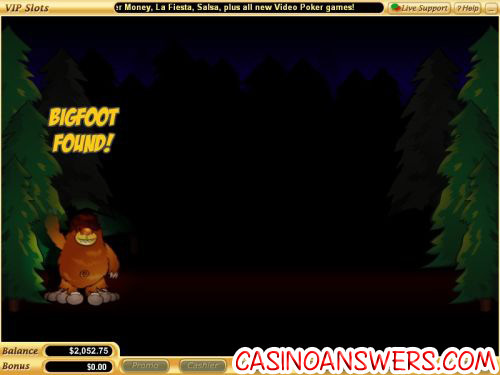 We can’t tell you whether Bigfoot is a hoax or not, but what isn’t a hoax is the 100% up to $800 signup bonus you can get for playing the Big Foot video slot at English Harbour Casino! 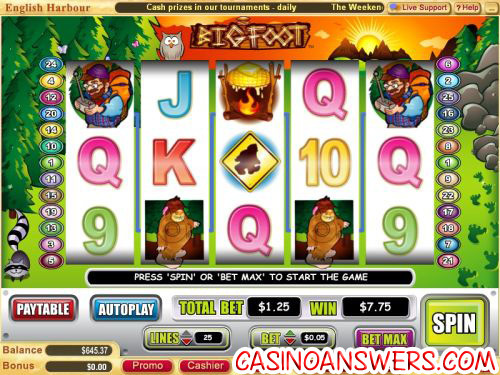 Can I find the Bigfoot video slot at any US-friendly online casinos? Yes, all Vegas Technology casinos are US-friendly. That means that if you live in the United States, you can play the Big Foot video slot at both English Harbour Casino and Online Vegas Casino.